[NOAA] It came as a surprise: A series of large waves rolled into New Jersey’s Barnegat Inlet six years ago, dragging a group of divers up and over a breakwater. According to report, the waves then crashed into a jetty where they knocked people into the water, causing injury and property damage. Eyewitnesses reported seeing waves as high as 6 feet. But how? There had been no earthquakes or underwater landslides in the area. NOAA scientists determined these waves were part of a meteotsunami, a small, weather-driven tsunami caused by changes in air pressure created by fast-moving severe thunderstorms, tropical storms, squalls or other storm fronts. The waves that hit New Jersey were generated from an intense, offshore squall line known as a derecho and were detected by more than 16 NOAA tide gauges along the East coast. New research published this month by NOAA finds that, on average, the U.S. East Coast experiences about 25 meteotsunamis per year — though most are less than 1.5 feet high and relatively harmless. Only about one meteotsunami wave a year exceeds 2 feet in height, large enough to cause the injuries and destruction experienced in New Jersey. 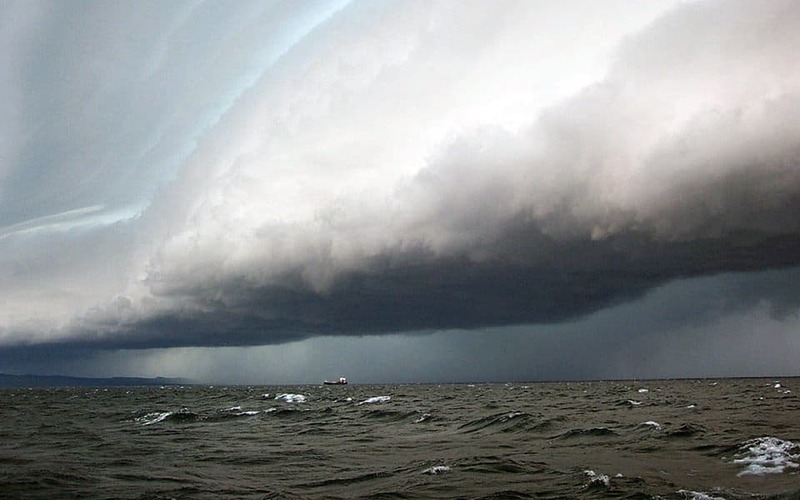 Meteotsunamis occur all over the world — including the Great Lakes — but scientists are just beginning to better detect and understand them. 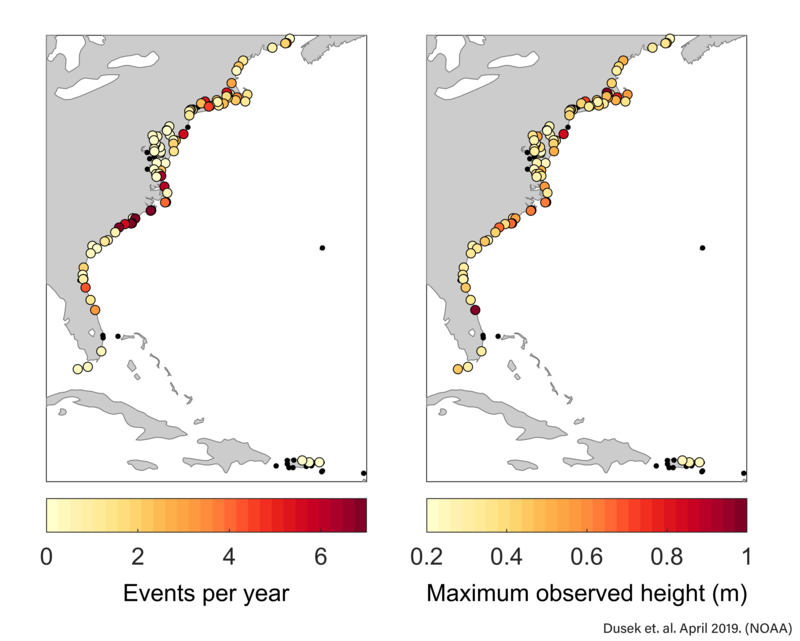 In order to identify the meteotsunamis, which often go unrecorded, study researchers analyzed 22 years (1996-2017) of water level observations from 125 NOAA and partner tide gauges on the East Coast. They found evidence of 548 meteotsunamis, including one that occurred during Hurricane Irma in 2017. East Coast meteotsunamis happen most often in summer, especially in July — because of thunderstorms — and in the winter due to nor’easters. Research shows that they occur most often in the Carolinas, northern Florida and Long Island Sound, with the largest waves found in areas where estuaries or the shape of the coastline has amplified them. Myrtle Beach, South Carolina, and Duck, North Carolina, observed the greatest number of events: 148 (7.2 per year) and 130 (6.0 per year), respectively. Wrightsville Beach (8.7 per year) and Cape Hatteras (8.9 per year) in North Carolina had the highest averages per year for any station with at least five years of data. NOAA’s Great Lakes Environmental Research Laboratory are working with partners on developing a real-time meteotsunami warning system in the Great Lakes. The National Weather Service is developing the capability to provide accurate and timely public alerts when meteotsunamis are detected by deep-ocean pressure sensors or coastal high-frequency radars. The National Tsunami Warning Center works hand-in-hand with coastal weather forecast offices to alert people along the coast to potential local threats. NOAA scientists are also helping organize the First World Conference on Meteotsunamis taking place in May 2019. NOAA scientists are also helping organize the First World Conference on Meteotsunamis taking place in May 2019.